I love to read diaries. Especially those written by small kids because those cute little diaries portray the innocence of small children. For example, I've read a few pages of the Diary of Young Girl (Anne Frank). 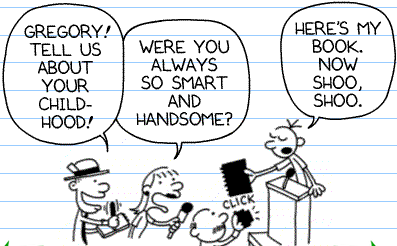 And recently, while there was a sale going on Amazon, I purchased "Diary of a Wimpy Kid" by Jeff Kinney. The Wimpy Kid series is quite popular amongst the kids with 9 other releases and a movie based on it. Jeffrey "Jeff Kinney" is an American game designer, cartoonist, producer, actor and author of the Wimpy Kid Series of books. 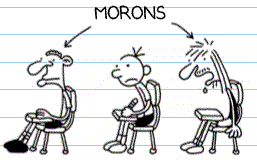 In the Wimpy Kid series, Jeff writes about the daily struggles of a boy named Greg Heffley in middle school. I haven't read the whole book, but read a few initial pages and was impressed by its satirical narration. First of all, let me get something straight: this is a JOURNAL, not a diary. I know what it says on the cover, but when Mom went out to buy this thing I SPECIFICALLY told her to get one that didn't say "diary" on it. So just don't expect me to be all "Dear Diary" this and "Dear Diary" that. The only reason I agreed to do this at all is because I figure later on when I'm rich and famous, I'll have better things to do than answer people's stupid questions all day long. So this book is gonna come in handy. Next he starts writing about his middle school and how he is stuck there with a bunch of morons. I liked the way in which the diary (oh sorry, JOURNAL) has been written accompanied with funny cartoons. Recommended for all the kids above 7. Also a good read for elders.